There’s no denying that hats draw a lot of attention when worn out. Sometimes they win casual praise and admiration but they also inspire shocking abuse. In fact, the sensation of a headband and the captive heat can make wearers feel more self-concious and embarassed. To a certain extent hat wearers are an oppressed minority. Of course the option to wear a hat is a world apart from huge global issues of race, gender, sexuality, poverty and more, but for a friendly community of Goths, Steampunks, vintage enthusiasts and more, the right to wear a hat is one that is constantly challenged and not just by having manners indoors. Hats are not only likely to draw eye and abuse from passersby but are a vulnerable target for theft and worse. 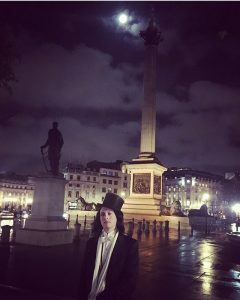 Jonny Haart (pictured), organizer of London’s New Romantic night Yesterday’s Shadow, was returning home in Leyton, East London, in the early hours of one Sunday morning when his antique silk top hat was stolen from his head as he left the tube station. Similarly the constant sartorial connoisseur James Blah left his vintage homburg hat on his bag in the corner of a Covent Garden pub and a barman took it when it fell on the floor, attempted to fold the stiff felt and dumped it in a bowl behind the bar. Period party girl from London Louise Newton said: “I’ve had a full Marie Antoinette wig and tricorn hat snatched off my head twice. On both occasions, the two were attached and were pinned to my hair which was ripped out.” Other responses mentioned people trying on fascinators by pulling them from a wearer’s head. Simon Satori, Napoleonic reenactor and Steampunk performer, says he has a personal distaste for the ignorance of those that shout abuse at hat wearers. “Baseball caps are strangely the only acceptable headwear at the moment, and you can wear one of these back-to-front or right-way-round without anyone pointing at you and shouting. But every other hat worn by a bloke gets abuse and usually of the most simplistic kind. In particular I hate the ‘Oi Jack Sparrow!’ if I’m wearing a tricorn. It doesn’t matter what else I’m wearing – somehow a hat that has been a stalwart of various professions for almost three hundred years is now only known for a fictional pirate,” he said. This 1920s Lincoln Bennett Black Silk Top Hat is for sale for £245. This is the unfortunate side-effect of dressing up. Those who don’t get it would rather attack it than attempt to understand it. What is more, most people see hats as mere funny accessories when in reality many are high quality antiques costing more than £100. Silk top hats haven’t been made for nearly half a century and are growing increasingly rare with larger examples worth thousands. The silk top hat and frock coat is the uniform of the 19th Century elite but to anyone else it is the Monopoly man. The result is a state of oppression when gorgeous headpieces are locked away in the darkness for fear of being snatched away so easily. There was also a time when hats held a place in society with facilities provided for them. Now they are stuffed under tables as soft beanie hats are shoved in pockets or into bags. Indiana Jones famously returned to a closing door to retrieve his iconic fedora but today anything grander than soft brown felt risks loss and damage. Let’s face it – most of us into costume aren’t exactly built like rugby players apart from some reenactors. If we stop wearing hats then we give in to ignorance. But equally perhaps we should be more modest in the hats we wear to minimise the cost of any loss. Hunt for bargains on Ebay and maybe make do for a slightly poorer condition. 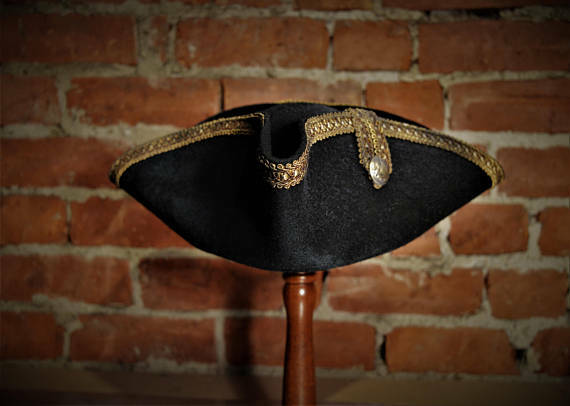 Cover image: An incredible tricorn for sale at PVentressHatShop. If Fur is Murder What About Astrakhan? I wear a deerstalker (and frock coat with a capelet) in Winter, as practical wear…you can imaging how sick I am of hearing Sherlock Holmes comments. Most of the time I wear a broad brimmed felt hat (the black wool blank from JAS Townsend) to shade my eyes, and really only receive compliments on it.